Awake after chemo week, New WIP – Squirrel, and Whooooo Hooooooo! After this week’s chemo treatment, I slept until Friday, was up a couple of hours, back to sleep and I am actually awake today. The nice part about sleeping the week away is that I miss out on all of the nausea. SO ONLY four treatments to go!!! We are 2/3s of the way through. We meet with the oncologist next week, so hopefully will find more improvement! Last week’s learning: I learned NOT to drink a large fresh veggie juice. Must start with smaller quantities. It really played havoc with the digestion system. All recovered, hubby survived all of the gas and complaining, and everything is back to the “new” normal. SO thought I would try a pastel on the multimedia paper, since it is so rough. It seems to take many layers, and so far so good. See what you think. 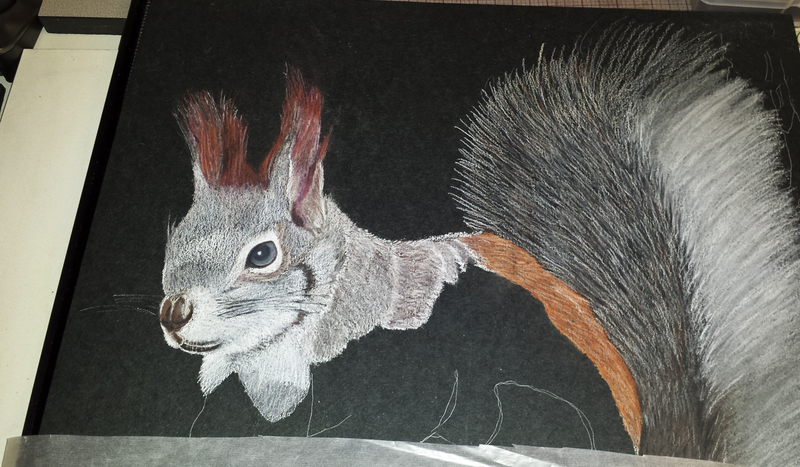 This is from a photo of a squirrel we saw on one of our Flagstaff trips. Am still to tired to bring out the camera and tripod, so this is a shot from my cell phone. Don’t forget to click on it for a larger view.